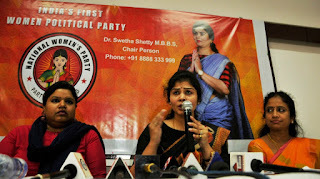 "The battle to get a reservation in the parliament has been for over twenty years now. The grueling fact is that we live in a society where most of the political decisions are governed by the males and not having an equal say in the parliament just narrows the possibility of empowering women. With this party’s initiative, we aim to create an environment for full development of women which enables them to realize their full potential and help in achievement of goals of empowerment," Shetty said. Talking about future plans, NWP soon plans to launch a mobile app called Mahila Rakshak (Safety App) which aims at giving women assistance in times of emergency. The app requires its user to, when in danger, shake the phone or say 'HELP' multiple times which in turn sends SMS alert to 3 friends and relatives. "Women’s safety is of utmost importance considering the rise in cases of crimes in the recent times. Through these initiatives, I strongly wish that every girl should be able to live wholesome life and step out of home without any danger," she added.